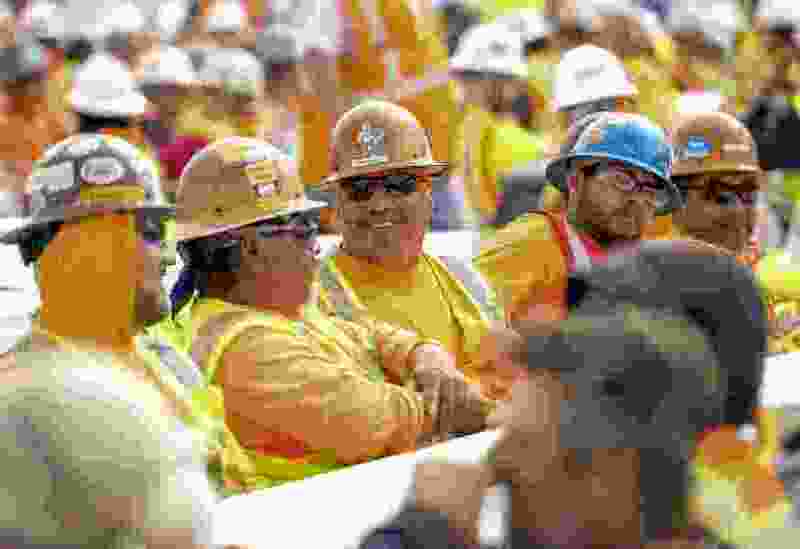 (Leah Hogsten | Tribune file photo) Thousands of workers from all trades have participated constructing the new $485 million, 866,087 square foot, Salt Lake City International terminal building, Tuesday, May 22, 2018. Utah leads the nation in job growth by percentage over the last 12 months in construction, which saw a 6.2 increase in the number of jobs. Some may be tall, others short. Some may be smart, and others not. But new census data say Utahns now top the nation for being relatively equal, or homogenous, in one major way: their incomes. “We don’t have a lot of really high earners, and we don’t have a lot of people on the other end either. We have a lot in the middle,” said Lecia Langston, senior economist for the Utah Department of Workforce Services. Still, despite the new top ranking, Utah is changing — and less equal over time, said Pam Perlich, director of demographic research at the University of Utah’s Kem C. Gardner Policy Institute. “We have a more equal distribution of income now, but we are becoming more unequal — as the nation is. We’re getting more rich people, and more poor people. Our middle class is shrinking. This is happening to a lesser extent than nationally,” she said. The finding that Utah ranks No. 1 nationally for income equality is among the more interesting findings as the U.S. Census Bureau released its annual American Community Survey of 2017, with hundreds of categories of social economic, demographic and housing statistics. Among significant finding are that median Utah incomes are up, and poverty is down — thanks to Utah’s still-booming economy. And, of course, Utahns tend to be a lot alike when it comes to their incomes. Income equality is measured by the “GINI Index,” which gives scores between zero and one. A score of one means one household would have all the income. A score of zero indicates perfect equality. Utah’s score is 0.423, lowest in the nation, barely passing former No. 1 Alaska, which scored 0.424. Utah has been close to the top in rankings in recent years, and now is No. 1. New estimates also say that only 4.2 percent of Utah households receive less than $10,000 a year. And only 5.7 percent make $200,000 or more. Among those in the middle, the Census Bureau estimates that 20.5 percent of Utah households earn $50,000 to $74,999; 17.9 percent earn $100,000 to 149,999; 14.9 percent earn $75,000 to $99,999; and 12.4 percent earn $35,000 to $49,999. Perlich and Langston list several reasons why incomes are more equal in Utah than in other states. She also notes that Utah has the youngest median age in the nation [31 years old]. “When you have a very young area, you don’t have as many big earners because those tend to be in their 50s. So there is a smaller share of the really high earners, which tends to level the playing field,” she said. While Utah may rank overall as relatively homogenous by income, some big differences still exist between different communities. West Jordan had the lowest GINI Index, or most equality within its borders, among 10 larger Utah cities included in new estimates. Its score was 0.330. Others with low scores were Layton, 0.3510; South Jordan, 0.3608; and West Valley City, 0.3629. The highest score (or least income equality in its boundaries) was in Salt Lake City, 0.4929 — where big differences may be seen between the ritzy upper Avenues and low-income west-side areas, for example. Others with relatively high scores include Provo, 0.4734; and Ogden, 0.4632. Some cities that are relatively equal within their own boundaries are quite different than their neighbors. For example, West Valley City and South Jordan had two of the top equality scores — and are not far apart geographically. But the median household income in South Jordan is far higher than in West Valley City: $103,534 compared to $65,143. Health insurance • 9.2 percent of Utahns lack health insurance. That is slightly worse than in 2016, when 8.8 percent was uninsured. Poverty • Utah’s poverty rate in 2017 was 9.7 percent. down from 10.2 percent the previous year. That was sixth lowest nationally. The national poverty rate was 13.4 percent. Median household income • It was $68,358, up by 1.8 percent from $67,128 the previous year. The national median was $58,820. Utah’s tends to be higher because of large families, and this figure combines income from all household members. Age • The state’s median age is now 31 years old, up from 30.7 a year earlier. The average age at first marriage for women is 24.8 years, up from 24.7; the average age at first marriage for men is 26.1 years, down from 26.3 the previous year.